Fresh from its success in the Nurofen Specific Pain products proceedings, the Australian Competition & Consumer Commission (ACCC) is looking for a repeat in bringing Federal Court for mislabelling of Voltaren Gel. In the Nurofen proceedings, the Federal Court fined Reckitt Benckiser (Australia) Pty Ltd $6 million for misleading labelling. On 5 December 2017, the ACCC commenced proceedings against two pharmaceutical companies, Glaxosmithkline Consumer Healthcare Australia Pty Ltd and Novartis Consumer Health Australasia Pty Ltd. The ACCC alleges that GSK and Novartis misleadingly labelled Voltaren Osteo Gel as effective for osteoarthritis to charge a price premium, compared with Voltaren Emugel which has exactly the same formulation. The two Voltaren Gel products are OTC (over-the-counter) products sold to the public in pharmacies and supermarkets. 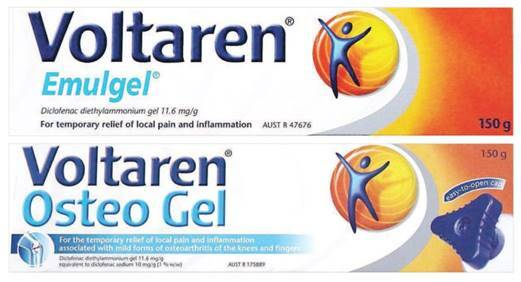 The ACCC alleges that Novartis and GSK represented that Voltaren Osteo Gel was specifically formulated for treating osteoarthritis conditions, and was more effective than Voltaren Emulgel to treat those conditions, when the two products are identically formulated. Both products contain the same active ingredient, diclofenac diethylammonium gel 11.6mg/g, which acts in a non-specific manner to reduce local pain and inflammation wherever it is applied. Price sampling conducted by the ACCC at supermarkets and pharmacies found that Voltaren Osteo Gel is often sold at a significant price premium to Voltaren Emulgel. For example, Votaren Osteo Gel 150g was found in-store at up to $7.50 (or 33%) more than Voltaren Emulgel 150g. The recommended retail price of Voltaren Osteo Gel 150g was $28.99 compared with $25.99 for Votaren Emulgel 150g. In 2016 GSK acquired Novartis’ portfolio of Voltaren products and has been responsible for marketing and selling Voltaren products since that time. GSK is the leading supplier of over-the-counter analgesic products in Australia, with brands including Panadol and Voltaren. The ACCC claims that Novartis and GSK made the alleged false or misleading representations on product packaging and the website www.voltaren.com.au. The Osteo Gel packaging shown in the image was in use from about October 2010 to March 2017. In March 2017, GSK amended the Osteo Gel packaging to include the statement “Same effective formula as Voltaren Emulgel” directly under the product name. The ACCC alleges that the amended Osteo Gel packaging is also likely to be misleading. What parallels can the ACCC draw between the Nurofen and the Voltaren labelling? According to the ACCC Media Release: “The alleged conduct is particularly concerning, given the significant penalties handed down by the court against the makers of Nurofen for what we consider to be similar conduct,” Mr Sims said. Voltaren Osteo Gel : For temporary relief of local pain and inflammation associated with mild forms of osteoarthritis of the knees and fingers. It is the osteoarthritis claim in the Osteo Gel together with the use of ‘Osteo’ in the name that is questioned by the ACCC. Voltaren Osteo Gel is sold at a price premium of at least $3. GSK and Novartis admit that both products have the same effective formula. On its face therefore, there are strong parallels with the Nurofen mislabelling. What scope is there for GSK and Novartis to argue their labelling is not misleading? GSK and Novartis have a line of argument which was not available in the Nurofen case, namely the caps on the tubes have different designs. On the Voltaren Osteo Gel label, there is an illustration of an easy-to-open cap for the tube. This cap is a large triangular cap, designed for people with arthritis who have reduced manual strength and dexterity to open the cap to access the tube of gel. The cap on the Voltaren Emugel tube is the standard small grooved screw cap. GSK and Novartis are expected to argue that the labels are not misleading because the capping is a genuine difference between the two products. And that the triangular cap justifies the price premium of $3 in terms of recommended price. No two cases are the same factually. There are limits to how far the Nurofen decision can be used as a precedent. The outcome of the Voltaren proceedings will shed further light on how pharmaceutical companies need to differentiate different versions of the same branded products to avoid being accused of misleadingly charging a price premium for what is essentially the same product.